Friends of Animals would like to announce the release of a new public service announcement, now available via Internet. The name of the video is Alaska Wolves. 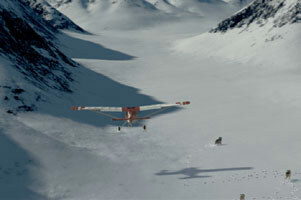 Alaska Wolves brings to viewers a dramatized scene of aerial wolf hunting. The practice was ended in Alaska in the 1970s, and the state's residents have actually voted twice to end same-day use of aircraft for public wolf hunting and trapping. Yet pilots in search of prey have come back to haunt North American wolves under the Governor Frank Murkowski's undemocratic leadership. It is now clear that the Alaskans who want an end to the hunts need outside support. Alaska seems remote to many, but we believe that people will be motivated to intervene on behalf of the wolves once the world sees what is happening. Friends of Animals would like to thank the following individuals who contributed to the creation of this public service announcement: Chooi-Leng Tan, Todd Kuehnl, Arnold Gallardo, Scott Moran, Nathan Searles, Barbara LaRue, Leo Keeler, Dorothy Keeler, and Josh Schaerti.